(Newser) – Let them eat cake? Maybe not on JetBlue. 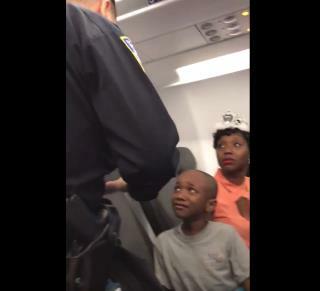 A New Jersey family en route to Las Vegas was kicked off their JetBlue flight after a dispute with flight attendants over birthday cake. According to the New York Daily News, Cameron and Minta Burke were off to Vegas to celebrate Minta’s 40th birthday with their two children on May 3. They say a birthday cake, part of their carry-on luggage, was placed in an overhead bin until a flight attendant asked them to move it to a different compartment, before finally deciding it belonged under their seats. Now enter a second flight attendant, says Cameron, who began berating the first airline worker, and then him. "She said I was being non-compliant," recalls Burke. "I said, ‘Miss, have you been drinking?’ because her behavior was irrational, and she stormed off." I was once accused of cursing one. I didn't. That's what they always say when you question anything. Get out your cellphone and record every interaction, and say everything loudly so other passengers hear every word you say. The family messed up. You don't give lip service to any of the flight crew. Funny. The first thing the family did was call Rev. Al's National Action Network. Were they trying to start trouble? or looking for a payout? or both? I hope the entire cabin sang Happy Birthday as the family was escorted off. My message to the family, " Where are your manors? " While not impossible that the family's version is true, it is much more likely that the airline's version is true. Do you really think that they would kick everyone off of a plane if the family's version were true? And would there not be countless people on the flight supporting the family's version if those passengers had to leave the flight for the reasons stated by the family? If what the family says is true, there would probably be an uprising on the plane if everyone had to leave. It is overwhelmingly likely that the family is not telling an accurate version of what happened. I was expecting more of this kind of stuff after the big payoff that United gave to that criminal doctor who was dragged off the plane. (And before you comment, I am not supporting how that was handled, but the doctor was given a total pass by the mass reality, when he was at least half responsible for what happened because of his adamantine refusal to leave the plane as requested).